Bellwood-Antis School District hosted a STEM night and a group of 8th grade student showcased their innovative project which involved generating and storing energy by using a shoe. Their project idea came from 8th grade science teacher, Travis Martin, CSATS Fellow, who worked in an engineering research lab at Penn State University Park during summer 2016. A Penn State University program providing a "pipeline" for teachers to professional development in science, technology, engineering and math or STEM education was a primary topic at Tuesday's Fayette Business Education Partnership meeting at Penn State-Fayette, The Eberly Campus, in Lemont Furnace. A workshop was held last week at Penn State that gave 15 middle and high school teachers the chance to participate and collaborate with polar research scientists, educators and more. The idea was to teach climate change information to educators with the hope that they could use the information in class curriculum and inspire students to take an active interest in climate change research. UNIVERSITY PARK, Pa. — Twelve years ago, the Center for Science and the Schools (CSATS) was established in the College of Education. A University-wide center, CSATS assists Penn State researchers with their grant endeavors and connects them with K-12 schools to promote research-based professional development opportunities for teachers. INGATE - When it comes to competition, middle school students in the Londonderry School science club said it’s “friendly.” So, when eighth-grader Seth Carter went out of his way to help another competing team from the same Harrisburg-based school he attends, on a wind turbine project, it wasn’t that big of a deal. TYRONE - Most students spend their summers visiting area swimming pools or improving their tans, but a pair from Tyrone Area High School chose to spend last year’s vacation immersed in academics. 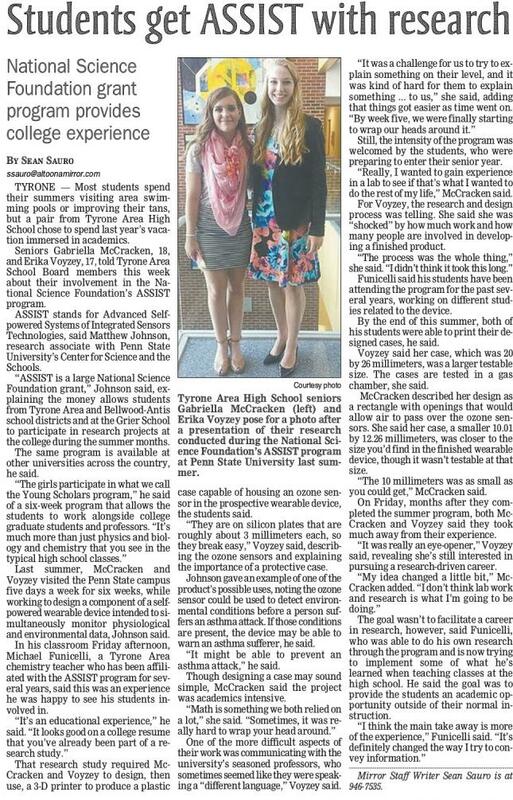 Eniors Gabriella McCracken, 18, and Erika Voyzey, 17, told Tyrone Area School Board member this week about their involvement in the National Science Foundation’s ASSIST program. Grants from the federal government and other sources can ease the strain on a researcher whose entire research program and sometimes promotion and tenure can depend on such funding. CSATS Penn State’s Center for Science and the Schools (CSATS) works with faculty researchers in the science, technology, engineering and mathematics (STEM) fields to provide guidance to meet the broader impacts (BI) requirements of grant-funding agencies. The Center for Science and the Schools (CSATS), a University-wide center based in Penn State’s College of Education, uses knowledge and experiences of science and engineering education to develop and foster teacher-researcher partnerships that strengthen science and engineering education at all levels. University Park, Pa. -- Faculty in Penn State's Eberly College of Science and the Center for Science and the Schools (CSATS) in the College of Education have launched a new program to develop graduate expertise in science communication by incorporating science and technology research into local elementary and junior high school classrooms. UNIVERSITY PARK, Pa.—Penn State’s Center for Science and the Schools (CSATS) works to strengthen science and technology education in K–12 schools. One way CSATS achieves this goal is through a special science outreach program called Saturday Science Workshops.